A reading from the gospel of John 18:33-37. We break into the portion of the gospel when Jesus has been brought before Pilate to be condemned to crucifixion. Already Pilate has been outside to talk to the religious leaders who have brought Jesus to the local Roman ruler. And Pilate’s wondered if this man isn’t innocent. He returns to his headquarters to speak to Jesus directly. Listen for God’s word to us. There’s a couple in my new neighborhood who have been really welcoming to me. The first day when I was moving in some boxes, they walked by and made a point to introduce themselves. Then a few weeks ago they stopped in to tell me of an upcoming neighborhood potluck. I didn’t know for sure where they lived until one morning when I passed by a house and the man was outside doing something to his car. He’s always so chipper – no matter the early hour. It’s impressive to me as I barely am awake most mornings when I’m out there walking my dog. One day I noticed a sticker on the back window of their car. It reads: “Not of this world.” . . . I’ve been a little confused as to what exactly they intend with their sticker. Especially because it’s on the back window of their sleek, silver Infiniti, which leaves me wondering if they bought the car to keep themselves focused on infinity, as in eternity; or if they really are focused on a luxury vehicle and the sticker is just an after-thought. I’m not so sure I like the sticker – what with a long Christian history of abuse of physical matter in this world due to misguided understandings of God. After all, if spirit was all good and matter was all bad, God never would have created physical matter. This beautiful earth with all its creatures including us, who are an interesting elixir of spirit and matter. The breath of God breathed into the soil of the earth, according to the Genesis 2 telling of it (Genesis 2:7). If the world was all bad and the spirit was all that was good, then certainly God wouldn’t have taken on our physical flesh in Jesus the Christ. I know we focus a lot on his death and resurrection, but he really was a living human being – like each one of us. It must have been so cool to be him – excited each day to wake up in a home with parents around him, and feet to put on the ground, and taste buds to take in that first sip of whatever it was he’d drink each morning. He finally had ears to hear the sweet songs of the birds and muscles to feel the strain of physical labor – the wood in his hands as he worked alongside his dad. He could feel the hot sun on his back as they built and notice the beautiful colors as it began to set each night. He had a brain to think and try to keep calm. And a heart beating in the center of his chest with which he could feel the full range of human emotions. I do believe that if God didn’t value the physical stuff of this world – including all the stuff of human flesh, then God never would have chosen to be in-fleshed among us in Jesus the Christ. . . . I don’t like stickers that lead people to believe that the matter of this world somehow needs to be escaped. Because we wouldn’t need to waste any time on Advent and Christmas if that was the case. . . . For God so loved this world, God in Christ came to us in a new and wonderful way! It’s Christ the King Sunday – the final Sunday of the liturgical year. It’s the culmination of the cyclical story that takes us in Advent through the waiting, waiting, waiting for God to act among us in a new way, to the in-breaking of Christ as a baby in Bethlehem, to his radical way of living among us which led directly to his death but could not be the end for a God who is Life and would start something amazing among us through the Spirit so that we would grow together in this world to walk that same radical path of love. Today we remember Christ is King! He reigns supreme with the strongest power known in the universe. Not force, in which the powers of this world put all their hope; but love. This year in the Christ the King lectionary, we’re taken right to the judgment seat of Pilate. Here in the gospel of John a seemingly private conversation between Jesus and Pilate is recorded. . . . It might be helpful to remember that John is the latest written gospel and it begins with that beautiful poetry of “In the beginning” (John 1:1-14). There was God. There was Word. There was Spirit and the outflow of their love created the world. The continuing outflow of their love caused it to be that Word would take on flesh to dwell among us. . . . Jesus attempts to explain this to Nicodemus when Nicodemus comes to him in the shadow of night trying to understand what Jesus might be up to. As the gospel of John records the story, it’s the first teaching of Jesus and it begins like this: “Very truly I tell you, no one can see the kingdom of God without being born from above” (John 3:3). If you’re scratching your head going: “Huh?” Don’t be alarmed. Supposedly Nicodemus was a part of those who devoted their whole lives to understanding God and he’s just as confused as the next. In her book entitled The Wisdom Jesus: Transforming Heart and Mind, Cynthia Bourgeault makes the case that Jesus isn’t just the Savior of the world – here to die and be raised to new life for us, as we’ve primarily come to emphasize in the Christian tradition of the West. Jesus also is a wisdom teacher – one among us to perk our consciousness that we might come to know how to live. How to follow the path of his Way. It’s why so much of what Jesus teaches is hard for us to grasp. People seek to take him at face value like he’s a teacher who rattles off fact after concrete literal fact. When wisdom teachers speak, according to Bourgeault, “pithy sayings, puzzles, and parables” all for the sake of the transformation of the human being (The Wisdom Jesus, p. 23). Bougeault points out that much of Western Christianity has seen the kingdom of God in one of two different ways. She writes: “A lot of Christians . . . assume that the Kingdom of Heaven (or of God) means the place where you go when you die – if you’ve been good.” . . . Others “equate the Kingdom of Heaven with an earthly utopia . . . a realm of peace and justice, where human beings live together in harmony and fair distribution of economic assets” (Ibid., p. 30). I’ve heard of both, haven’t you? In fact, one or the other, or both, seem the concern of Pilate. He’s Rome’s representative in Jerusalem, after all. If Jesus is a King, he needs to know if the Caesarea has anything to be worried about. As Jesus stands before Pilate, he’s asked: “Are you the King of the Jews?” (John 18:33). In the vein of a true teacher of wisdom, Jesus turns back the question on the questioner: “Do you ask this on your own, or did others tell you about me?” (John 18:34). He might as well have been saying: “What do you think, Pilate? You see the leaders out there wanting to do me in. Am I the King of the Jews?” Insisting Jesus reveal his crimes, Jesus finally tells Pilate: “My kingdom is not of this world. That’s easy enough to see or else my followers would be here storming the gates to free me. Using the very same force Rome and the powers of this world rely upon” (John 18:36). . . . I wish the gospel writer would have used a word other than the same one used in the rest of the gospel of John. Like instead of saying: “The Word was in the world, and the world came into being through him . . . And for God so loved the world” (John 1 & 3); I wish the word on Jesus’ lips before Pilate would have been translated society. Culture. Even way, as in: “my kingdom is not like your way.” Anything to keep us from thinking that Jesus wants nothing to do with the physical stuff of this world. His kingdom is not of this world in the sense of the norms, rituals, and values of so much of our society. But it is right here and now; in this world. . . . He says it himself when elsewhere the Pharisees ask him when the Kingdom of God will arrive. Luke 17:20-21 records his answer as: “The kingdom of God is not coming with things that can be observed . . . for in fact, the kingdom of God is within you.” . . . In Putting on the Mind of Christ, Jim Marion suggests a third way to think about it. He concludes that the kingdom of God might just be “a metaphor for a state of consciousness . . . a whole new way of looking at the world, a transformed awareness that literally turns this world into a different place” . . . an awareness that sees no separation between God and humans, and humans and other humans. (The Wisdom Jesus, pp. 30-31). It’s a Oneness. A mutual indwelling, which Jesus tells his followers about a few chapters earlier in the gospel of John when they gather together that fatal night. He tells them: “I am in my Father, and you in me, and I in you . . . abide in me” (John 14:20; 15:4). When we’re aware of that kind of oneness – when we’re living that kind of unified sense, then the kingdom of God indeed is in us. I want to believe that’s how my new neighbors mean it as they dash around the neighborhood in their Infiniti. It could be the source of the man’s cheeriness every morning. For maybe when he greets me, he realizes I’m no stranger. Not some other who moved into the house one of his dear friends had to move out of in order to sell it. Maybe he sees us as one. Knows we’re not of this world because we’re in Christ and Christ in us; which makes us foreigners really to the ways propped up as heroic in the society in which we live. Maybe we’re both celebrating today that Christ is King – the One reigning in the kingdom that is present in us each and every day because we are citizens first of that Way. I want to believe we’ve both heard that truth from the lips of the One who deeply loves the physical, living matter of this world – you and me and all this precious earth. The One who shows us how to live in this world as ones not of this world. That’s Christ our King. This entry was posted in Sermons and tagged 22 November 2015 sermon, Christ the King Sunday, Culture, Cynthia Bourgeault, In but not of this World, John 18:33-37, Kingdom of God, Kingdom of Heaven, Not of this World, Society, The Wisdom Jesus, Ways of this world on November 25, 2015 by RevJule. A reading from Hebrews 10:23-25. Listen for God’s word to us. A reading from the gospel of Mark 13:1-8. Listen for God’s word to us. Before jumping into the sermon today, listen one more time to this text from Mark. This time I’ll be reading it from the version of the bible called The Message. See if it doesn’t offer greater insight into this portion of Scripture that so often has been interpreted as a message about an apocalypse – a terrible, final end to God’s beloved creation. Listen for God’s word to us. “As Jesus walked away from the Temple, one of his disciples said, “Teacher, look at that stonework! Those buildings!” Jesus said, “You’re impressed by this grandiose architecture? There’s not a stone in the whole works that is not going to end up in a heap of rubble.” Later, as he was sitting on Mount Olives in full view of the Temple, Peter, James, John, and Andrew got him off by himself and asked, “Tell us, when is this going to happen? What sign will we get that things are coming to a head?” Jesus began, “Watch out for doomsday deceivers. Many leaders are going to show up with forged identities claiming, ‘I’m the One.’ They will deceive a lot of people. When you hear of wars and rumored wars, keep your head and don’t panic. This is routine history, and no sign of the end. Nation will fight nation and ruler fight ruler, over and over. Earthquakes will occur in various places. There will be famines. But these things are nothing compared to what’s coming. This too is the word of God for the people of God. Thanks be to God! I’ve been getting texts for about the last week from a friend who is off for a celebratory trip to South Africa before returning home to jump into a new call to ministry! He and I became friends several years ago during a doctoral course in South Africa so it’s great to get such updates. I find myself smiling each time I get one because it was just three years ago almost to date that I spent a lot of late night phone time listening to his gut-wrenching panic. Though he had been in a pastoral position for over a decade and had been doing amazing work, someone started going after him because they sat at opposite ends of the theological spectrum. If you’ve never been in a church fight – or worse yet an all-out clergy attack, then you’re probably not aware of how awful it can be for everyone involved. My friend was convinced his world was coming to an end – not only because of the mess being caused in his professional life, but also because his mental and physical health were started to be effected greatly. It was a really dark, scary time. Many of us know a lot about such difficult situations – different circumstances, same gut-wrenching panic. . . . I’ve heard teens tell how things are just over! Because they couldn’t get the grade they wanted and now they won’t be able to get into the college of their choice. The world seems to be absolutely falling apart. And for those driven-dreamers, their world really is. . . . We’ve had friends or loved ones tell us of the unexpected diagnosis – or lived through the doctor telling us about our very own bodies. We’ve witnessed children break their parents’ hearts with self-destructive behavior that leads to life-altering consequences. We’ve lived through divorces and natural disasters and death and so much more – like the horrible events in Paris this week. . . . Spoken or unspoken, we even see lots of angst among churches these days. Because the pews aren’t filled like they used to be some twenty or more years ago. The updated research came out two weeks that the number of those claiming to be spiritual but wanting absolutely nothing to do with the church has increased more rapidly than expected since the last polling. Those of us still here sometimes may wonder if church as we’ve known and loved it soon will be extinct. . . . Especially weeks like this one, we know days when it feels like the world is absolutely falling apart. If we can get inside those feelings, I think we can come close to understanding the buzz in the air as Jesus and his disciples exited the Temple that day. The gospel of Mark records it as the final time Jesus will exit the Temple. 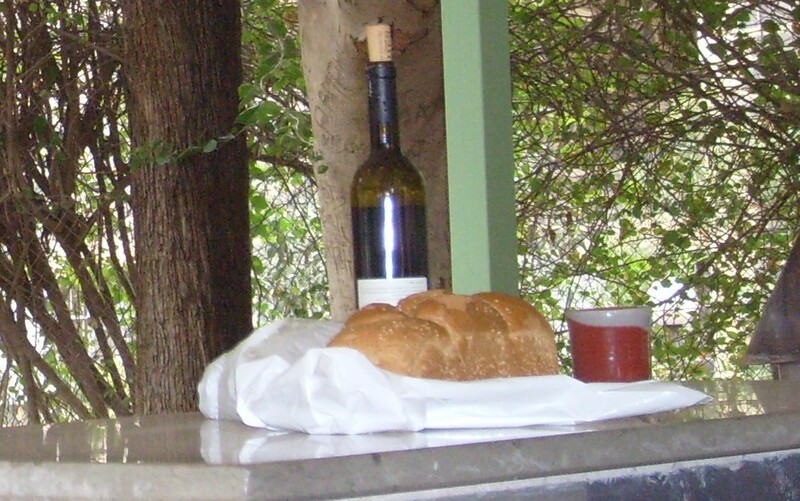 Just two days before that Passover in Jerusalem when he would gather with his friends in an upper room in order to get them ready for what was yet to come. He can feel it. Certainly they all can feel it – the tension rising between Jesus and those who just weren’t understanding his message. And those who understood entirely but for whatever reason felt incredibly threatened by what he had to say. I dare say it feels for them all – Jesus and his disciples, and the opposition too – it certainly must feel for them all like the world is falling apart. . . . Experts tell us that we all can handle a different amount of stress before we end up going reptile. And we go reptile in predictable ways. Hiding from it all like a turtle snapping away quickly in its shell. Darting about like a lizard to scurry from whatever’s coming. Hissing to any who will listen like a snake when the pressure’s at our boiling-point. Or worse yet: attacking whatever’s in our path like an alligator because we just can’t handle it any more. These are typical and predictable patterns of behavior for those who feel like their world is falling apart. It’s probably helpful for us each to ponder which way we end up going reptile. The world had been falling apart for a goodly long time for those living in First Century Palestine. In fact, things had been, and even now continue to be, pretty dicey in that little eastern Mediterranean byway. Throughout the centuries that little land had been ransacked by on-the-move armies over and over and over again. The stronghold of Megiddo – also called Armageddon – just 15 miles southwest of Nazareth, reveals 20 layers of re-built cities dating all the way back to 4000 BCE (The Holy Land: The Land of Jesus, Palphot, p. 70-71). That’s a whole lot of beginning again after endless conquering armies. The city of Sepphoris just four miles north of Nazareth, was overrun by Herod some thirty years before Jesus’ birth (Ibid., p. 26-27). We seldom remember that the stories of Jesus start with declarations of his time and place: “In the days of King Herod of Judea” the first chapter of the gospel of Luke reveals (Luke 1:5). Matthew records Jesus’ birth in Bethlehem followed by his family’s flight to Egypt to get out of the path of the enraged King (Matthew 2). At long last, they end up in the fertile land of the Galilee in Nazareth, which itself would face near destruction in the Jewish revolt against Rome three decades after Jesus’ death and resurrection (The Holy Land: The Land of Jesus, Palphot, p. 12-13) . These weren’t places far far away, half-way around their world. They were right in their own backyard. Several being geographically closer to them than many of us travel each day from home to work or the store or even here to this sanctuary. . . . It can leave us wondering if they all had just grown accustomed to such unsettling violence or if their nerves were absolutely fried – like some of our soldiers who return home these days with severe PTSD – post traumatic stress disorder. . . . The world for Jesus and his contemporaries routinely felt as if it literally was falling apart. The Temple leaders had been doing their best for years to keep Rome from coming in and totally taking over; though in the year 70 CE (right around the time we believe the gospel of Mark was written) it all would come crashing down, when the grandiose Temple of Jerusalem was totally destroyed by Rome, never to be re-built again. . . . In a lot of ways, Jesus wasn’t saying anything on that day upon his final exit of the Temple that everyone already hadn’t been speculating, and working to avoid, and fervently praying never to take place again. . . . It was as fragile as a time as our world seems today. Into that context – into that time and in that place, Jesus seeks to speak a word of hope. We know this. We know we know this. But when things seem to be falling apart, it’s really hard to remember. Thank God we have each other to remind us! . . . “These things are nothing compared to what’s coming,” Jesus continues according to The Message. Something so much better is on the way! The New Revised Standard Version captures it like this: “This is but the beginning of the birthpangs” (Mark 13:8). In other words, something amazing is about to be born! That’s what the birthpangs announce, right? A new life bursting into the world. Something beautiful trying to emerge. . . . It’s so easy to forget that God will make something new – even in our deepest loss. We’re not sure what – even with all the ultrasounds in the world, the doctors still can’t tell us what a new baby will be like. We’re left to receive it and enjoy the adventure of watching this new life unfold before our eyes. See what it will be like, what impact it will have, and how it will emerge into the world. . . . If Jesus were a coach, we’d hear him say: “Keep your eye on the ball. Keep your eye on the ball.” In the whirl and swirl of our days, don’t panic. What truly matters is what always has been true, God never changes: we love and serve and are sustained by a God who always brings new life. As sure as winter turns to spring, and birthpangs bring the baby. . . . Keep your head. Do not panic! God always makes something new. This entry was posted in Sermons and tagged 15 November 2015 sermon, Anxiety, apocalypse, Going Reptile, Mark 13:1-8 sermon, New Life, Panic, Resurrection, Spiritual but Not Religious, The Galilee on November 17, 2015 by RevJule.